The Civil War's greatest general as you've never seen him before, in a revealing collection of letters to his wife Julia introduced by Ron Chernow. 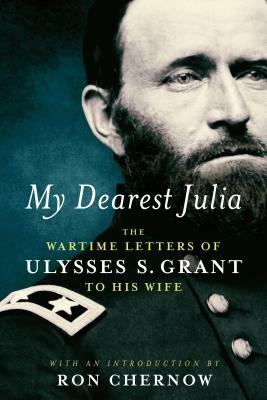 Ulysses S. Grant is justly celebrated as the author of one of the finest military autobiographies ever written, yet many readers of his Personal Memoirs are unaware that during his army years Grant wrote hundreds of intimate and revealing letters to his wife, Julia Dent Grant. Presented with an introduction by acclaimed biographer Ron Chernow, My Dearest Julia collects more than eighty of these letters, beginning with their engagement in 1844 and ending with the Union victory in 1865. They record Grant's first experience under fire in Mexico ("There is no great sport in having bullets flying about one in evry direction but I find they have less horror when among them than when in anticipation"), the aching homesickness that led him to resign from the peacetime army, and his rapid rise to high command during the Civil War. Often written in haste, sometimes within the sound of gunfire, his wartime letters vividly capture the immediacy and uncertainty of the conflict. Grant initially hoped for an early conclusion to the fighting, but then came to accept that the war would have no easy end. "The world has never seen so bloody or so protracted a battle as the one being fought," he wrote from Spotsylvania in 1864, "and I hope never will again." Born in Ohio in 1822, Ulysses S. Grant graduated from West Point and fought in the U.S.-Mexican War before marrying Julia Dent in 1848. During the Civil War Grant proved himself to be the conflict's greatest general and became a hero to millions. His two terms as president, 1869-77, were marked by conflict and controversy, but he won renewed admiration for writing his brilliant Personal Memoirs while suffering from throat cancer, completing them days before his death in 1885. Ron Chernow is the prizewinning author of seven books--including, most recently, the national best seller Grant--and the recipient of the 2015 National Humanities Medal. His first book, The House of Morgan, won the National Book Award, Washington: A Life won the Pulitzer Prize for Biography, and Alexander Hamilton--the inspiration for the Broadway musical--won the American History Book Prize. He resides in Brooklyn, New York.